Available now for all customers. Also in this release: worldwide mission planning charts for Military Flight Bag customers, select FBO on Flights, Graphical Briefing enhancements, and more. ForeFlight 9.5 is available on the App Store. ForeFlight on the iPhone now shares the same Tab Bar navigation design as on the iPad, making it easier to navigate between different app views and creating a better, more consistent experience across iPhone and iPad. With the new Flights view on iPhone, you can plan, brief, and file flight plans faster than ever before. ForeFlight also supports the high-resolution display on both iPhone X and the 10.5-inch iPad Pro. Briefings now sync automatically between iPhone, iPad, and the web. Retrieve a briefing and it becomes instantly available on any of your other signed-in devices. Also, Briefings are now created automatically for every filed flight plan and stored permanently in the ForeFlight Cloud. Graphical area forecasts are now included in the Graphical Briefing, replacing the legacy text-based CONUS area forecasts. 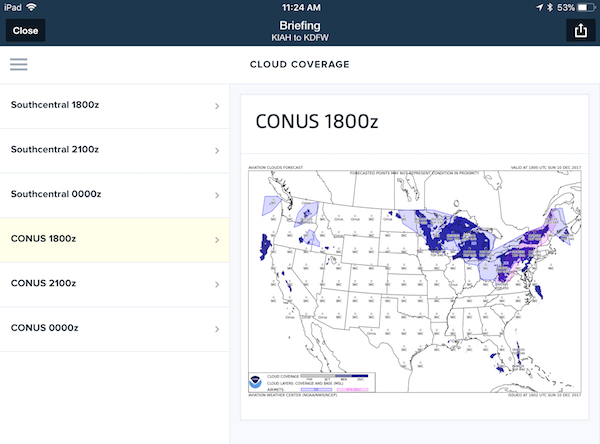 The new imagery for cloud cover, visibility, surface winds, and precipitation help you make better, faster analysis of the weather along your route. Tap on a graphic to view in fullscreen, then zoom and pan for a better view of the details. In the Flights view, a new Destination Services section allows you to choose an FBO at your destination airport for quick access to contact details, fuel prices, services, and more. ForeFlight automatically selects the same FBO on the next flight you plan to that airport, so your preferred FBO is always there for easy access. ForeFlight now offers the only mobile solution to download and display the complete library of Joint Operations Graphics (JOG), Tactical Pilot Charts (TPC), Operational Navigation Charts (ONC), and Range charts. The charts use the newest format standard in military digital chart technology, developed by the National Geospatial-Intelligence Agency, called Enhanced Compression Raster Graphics (ECRG). 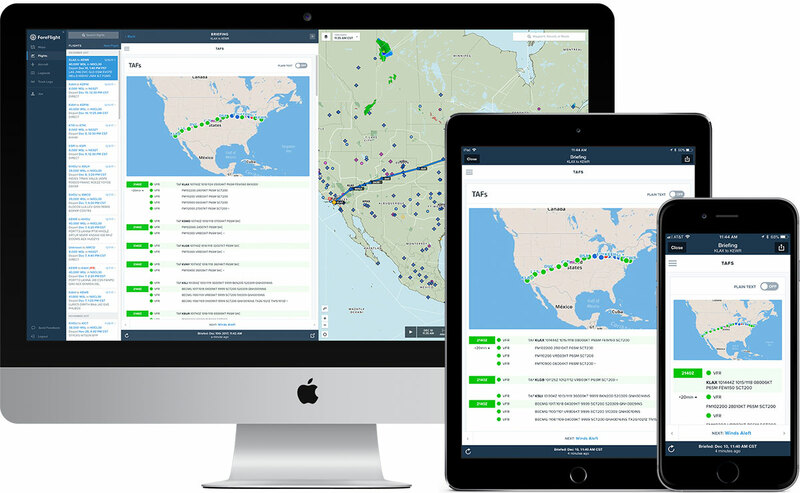 The ECRG format combined with ForeFlight’s compression process technology results in faster over-the-air (wireless) downloads, less used storage space, higher resolution, and quicker load times. An innovative new Graphical Chart Manager makes it fast and easy to select and download only the desired charts from the thousands available in the library. A small but powerful enhancement, you can now tap on any leg in your route on the Maps view to see information about it and take a number of actions, such as making it the active leg while flying.